There are a variety of common veterinary diseases, many of which mimic those in people. 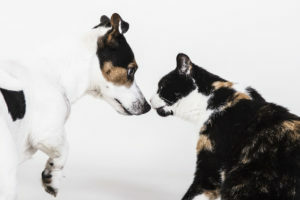 Dogs and cats (companion animals) suffer from a range of diseases and disorders, which often require treatment with veterinary drugs, devices, biologics, supplements, special diets, etc. Listed below are some of the common veterinary diseases and reasons for dogs and cats presenting to veterinary hospitals for treatment. Many of these conditions and diseases are very similar to human diseases, and many of the same treatments are used in dogs and cats as they are in people. How studying canine diseases such as cancer can benefit people and pets. In addition to cancer, dogs also develop a range of orthopedic, dermatological, ophthalmic, autoimmune, immune mediated, gastrointestinal, and other conditions which are comparative to humans. This similarity in pathophysiology allows researchers to study veterinary diseases which can lead to treatments for veterinary and human medicine.